Many of you have probably cut into an apple and sometimes noticed a watersoaked, glassy appearance. This defect is called watercore. Visible watercore if you can detect the glassy appearance without cutting the apple, or invisible watercore when there is not indication of the defect, unless you cut the apple in half. This defect is found in practically all apple growing regions around the world. It is usually attributed to growing conditions with intense heat and sunlight. High temperatures at the time the apples are approaching maturity favor its development. The disease is most likely to occur in fruits that are freely exposed to the sun. Certain varieties are more susceptible to watercore, such as Rambo, Jonathan, Red Delicious, Stayman and Winesap. But is it a defect? According the U.S. Grade Standards for Apples; If you find invisible watercore in Fuji apples it is never scored as a defect. Never. If you discover invisible watercore prior to February 1st, in any variety of apples, it is never scored as a defect. Visible watercore is a free from defect of all varieties of apples, includng Fujis (any time of year) in U.S. Extra Fancy, U.S. Fancy and U.S. No. 1 grades and any amount of watercore that is visible externally shall be scored against the 10% tolerance for the grade. 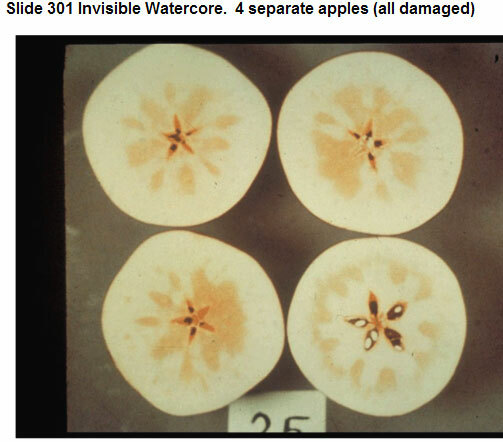 If the area of visible watercore exceeds 1/2 inch, the apple is scored as serious damage, against the 5% tolerance. OK, it is after February 1st, and I am finding invisible watercore. How much is allowed? Invisible watercore that is severe shall be scored as damage (10% tolerance) against the U.S. Extra Fancy and U. S. Fancy after January 31st of the year following the year of production (except for the Fuji variety of apples). It is never a defect of U.S. No. 1 or Cat. 1 apples. 3) more than a slight degree outside the circular area formed by the vascular bundles. The above photo is an official visual aid depicting 4 separate apples, cut in half, with scoreable invisible watercore. 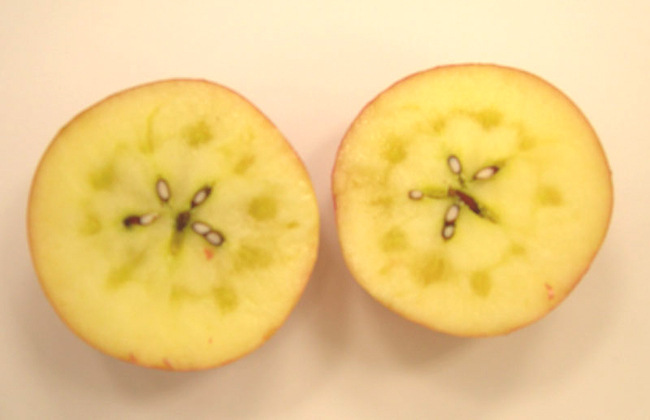 The top two apples and the apple on the bottom left show the watercore extending from the core to the vascular bundles. The apple on the bottom right depicts the watercore coalescing with three or more vascular bundles. If you would like further information regarding watercore please click this link, from Washington State University. I never considered it a “defect” in a apple. I have Fuji apples right now & all have a watercore, which is like having a hummingbird feeder in your apple. The apples are very sweet, firm & juicy. The watercore just adds to their appeal & taste..
A friend gave me some Kings off his tree several years ago. They had the most delicious candy spots in them. I went out and bought two King trees and planted them, only to learn that this wasn’t some special King apple trait or characteristic. So now I’m trying to find out how I can create this water core candy in my King apples. In reading, I find differing explanations for what causes this. I hope to find out how I can duplicate this and once again enjoy those most delicious candy apples!! Sherri, thanks for your question. I’ve always heard that watercore is caused by growing conditions, so to duplicate watercore in future crops may be out of your hands. Fuji apples are susceptible to watercore, but again, not all Fujis will have watercore.